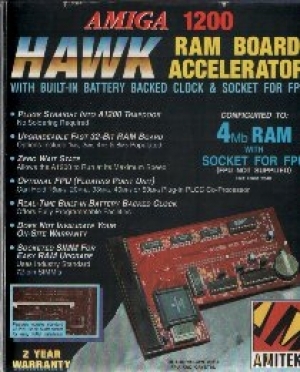 Home/Computers/Amiga/Amiga Accessories/Amiga 1200 RAM Board Accelerator. 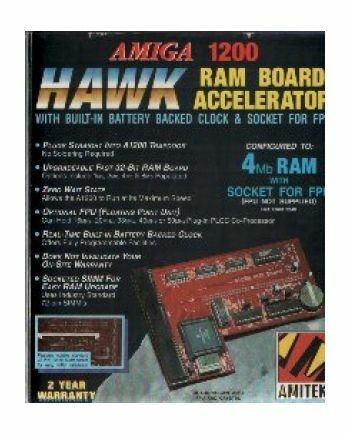 This RAM Accelerator board is for Amiga 1200 ONLY.Features: * Plugs straight int A1200 trapdoor, no soldering required. * Fast 32 Bit RAM Board. * Upgradeabnle RAM. * Allows the A1200 to run at it's maximum speed. * Tests RAM and FPU. * Built in battery backed clock. * Comprehensive manual. * Comes in original box.